Last night, Duke Energy held a public hearing on its proposed 17% rate hike. The room was packed with irate citizens, but many were turned away for lack of space. Most who did speak passionately opposed the rate hike, citing the health and environmental effects of coal pollution, or the economic hardship of such a big rate increase. The speaking continued for more than 4 hours. The Charlotte Observer published an article at the top of page 1A on the hearing's events, "Crowd jams hearing on Duke rate hike." The Business Journal also published an account of the hearing. 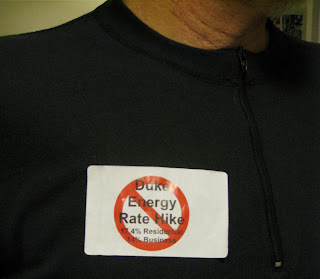 The hearing was preceded by street theater and a press conference with local organizers protesting Duke's persistent reliance on dangerous and expensive energy sources - coal and nuclear. Greenpeace, Rainforest Action Network, Carolinas Clean Air Coalition, and NC WARN were among organizations with Charlotte chapters that were active in preparing for the hearing. Ken and I were among the speakers. 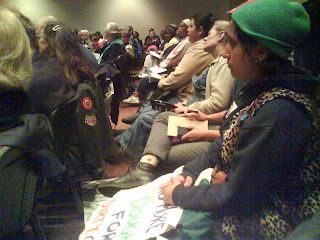 Below in blue flont is the short speech I made to the Utilities Commission members at the hearing (who will decide whether to approve the rate hike), to Duke attorneys and employees, and to the roomful of concerned citizens and activists. I talked about the long range effects of climate change (due to coal) and the unfairness of Duke's overcharging ratepayers in order to lure fearful investors. Investors should be afraid of high-risk and expensive nuclear and coal plants. Some of my remarks were quoted in the Charlotte Observer and in the Business Journal today (October 12). "I am a biologist, Ph.D., and author of 11 books on science topics. I’m going to comment on the global effect of adding more coal plants, and on the risk to investors, which is being passed on to ratepayers. "First of all, I personally would not mind paying any rate hike if the money were going toward developing clean and renewable energy, or energy efficiency. "I do object to any rate hike that goes toward building new coal plants, nuclear plants, and natural-gas plants. "As a biologist, I care deeply about all life on the planet, human life and wildlife. We are at an unprecedented turning point on the planet, for people and for wild things. Coal is one of the biggest contributors to greenhouse gases. If our generation doesn’t act right now, much of the biosphere as we know it will be destroyed by the effects of climate change. More than 80% of biologists believe we will experience mass extinctions of wildlife this century. So our descendants will live on a planet with maybe half of the wildlife species that we knew as children. As far as human life: you’re all aware, I’m sure, of how climate change will affect agriculture worldwide, creating floods and droughts that will cause widespread famine. Close to half of all humans live near coastlines that will be permanently flooded. "This climate emergency means we need to adopt drastic energy-efficiency programs and safe, renewable energy sources. But instead, Duke is building more fossil fuel and nuclear plants, at huge risk and expense. "Why? I don’t know why. It doesn’t make sense for the planet or financially. Investors know it too, which is why we’re being asked to pay more. Investors don’t like risk. They must be lured by a higher rate of return to invest in such risky energies. Financial risks to investors in coal and nuclear include probable EPA regulations regarding mercury, coal-ash waste, air toxins, a possible carbon tax, the cost of scrubbers, and Fukishima related nuclear-regulations. "Investors SHOULD be worried that Duke’s dangerous power plants will face expensive regulations to make them less dangerous. It’s not fair to make consumers pay more so Duke can use our money to attract investors to these dangerous energy sources. "Energy efficiency is by far the cheapest energy source. Wind and solar are both plummeting in price, while the costs of coal and nuclear plants and fuels keep going up. Once wind and solar resources are built, they have no fuel costs at all. Most importantly, energy-efficiency and renewable energy would preserve the climate and water on which all species, including the human species, depend." Hear, HEAR!! what an excellent, concise depiction of the problem. why won't the "powers that be" listen? ...before it's too late!! Thank you from the world. May I quote you at my place? Thank you Suzan. You are welcome to quote me. Here is more on those dern heatherns trying to raise our rates!